Content marketing is no longer a buzzword tactic. For many organizations, content marketing is now a core tenant of their lead generation strategy. For organizations not using content marketing yet, the barrier to entry can seem daunting. Content marketing is a costly activity – both in time and money. But, if executed properly, content marketing can yield tremendous results for senior care organizations. On this episode of the Senior Care Growth Show, we talk to Justin Champion, Principle Content Professor at HubSpot and author of “Inbound Content: A Step-by-Step Guide To Doing Content Marketing the Inbound Way” about how organizations can use content marketing to drive new leads. Listen now or read the full transcript below. Winston: Welcome to this episode of the Senior Care Growth Show. My name is Winston and I am super excited today to be joined by Justin Champion. Justin is the Principle Content Professor at HubSpot, one of the leading marketing automation platforms. I should say, the leading marketing automation platform out there. He’s also the author of a new book, Inbound Content. Justin, welcome to the Senior Care Growth Show. And just by way of introduction, maybe you could tell people a little bit about yourself. Justin: First of all, thanks for having me. I’ve been a digital marketer for about a decade now and before Hubspot I actually worked at agencies exclusive. I worked in the agency world from a search engine marketing firm to a digital marketing firm to a PR firm. And when I came to Hubspot I started off as a customer success manager. Really was a good way of giving me 200 customers where I could run an experiment in my funnel, find a problem. And really the biggest problem that I noticed, not only with Hubspot but over my entire career is people really have an issue of planning and creating content and that’s one thing I’m passionate about, which is really led me to my role as the content professor on Hubspot Academy. So I live the dream every day because I’m doing something I feel passionate about. Winston: Yeah. That’s awesome, Justin. Maybe you can tell everybody. Where are you dialing in from right now? Justin: Yeah. So I’m dialing in from Modesto, California. I’m in the midst of a Hubspot user group tour across the country doing a series of content marketing strategy workshops and I am in route to San Diego for my next event on July 12th. Winston: That’s awesome. Yeah. So Justin, I’m super excited to have you on the show. And today I figured we would talk about a topic that I know was of interest to a lot of our listeners and that’s how senior living communities can drive leads with content marketing. Obviously content marketing is a big investment of time and energy, and sometimes expense. And you want to have that return on investment in the form of new leads. So I guess first question, if a senior living marketers are out there listening, they’ve got a wide variety of tactics they could spend their time investing in; Why content marketing? Justin: So content marketing, specifically even with senior living centers, you are in the business of creating memories for the elderly. For people who are really looking to experience life with other people that really are looking for a solution of being able to connect with others. And I think specifically it’s an opportunity because you really have the ability of being able to tell the story of what that’s like through the current audience that you have a part of your center. So I think on one side, content marketing is a sustainable way of being able to communicate value online from an experiential perspective of people go into search engines actually looking for this content, but being able to tell this story, making an impact and really helping this person to understand what comes about with living in a senior living center. There’s a lot of stress that comes with people trying to care for their parents in their own home. And one thing I’ve experienced specifically with senior living centers is making people feel comfortable and excited about this next step in their life. Winston: Yeah, that’s great. And I guess, you know, my view of content marketing also is that you help to educate folks along in that process as they’re making that decision. A lot of times you hear people talk about making the site more of an educational resource. What does that mean and why is that important in this space? Justin: Yeah. So having an educational website, it’s gonna be really important to helping people understand what type of questions, making sure that you’re answering their questions in a way that’s going to be helpful ultimately to their audience, right? Like everybody has questions about everything and if you have, if you’re the site who’s able to answer these questions and being seen as a trusted advisor, that’s ultimately going to be something that’s going to help people turn into leads, build a relationship with you, and specifically with the senior living community, making sure that you help these people understand what to expect. Setting the right expectations so that they really know what’s gonna be coming up next. Winston: It’s such a big decision for folks. I do think supporting those decisions with the right information and being transparent through the website through content marketing. Let me ask you this, when we talk about content marketing, let’s get a little more specific. What do you mean by content marketing? What types of activities should people be spending their time on? How frequently should they be creating content? What are your recommendations there? Justin: Yeah, so really content marketing is really the strategic practice of creating relevant, consistent content that’s meant to attract and attain the attention of a specified audience and ultimately nurture that audience down to making a well informed decision. So specifically with this, where you would want to find time spending a or where do you want to spend your resources specifically with the senior living community is focusing on your current residents, right? Those are going to be the people are going to help you understand what do they like about their situation, what could be improved? If you really work with them, you’re gonna be able to understand the narrative that you can be telling ultimately, what do you want to be seen or perceived as? So what I would say would be most helpful is creating educational content. I think blogs are always a great way of being able to communicate the value of content that you have and the experience that you’re providing. Justin: I think social media is a way that you can get that content out there. Whether it’s reaching, you have to think of your different persona as a person, as a semi fictional representation. Is this an elderly person who’s looking for a specific place to live or is this more of a family that is looking for a solution for maybe a parent that is that is getting older. So you have to think about ultimately who you’re communicating with. I think the big thing from an educational resource perspective and something that I’ve seen that’s been really helpful is creating engaging content maybe in the form of like a guide or a white paper, like a case study is super helpful, like getting the story of an actual resident, what they think about this sort of lifestyle. I’d say is probably one of the most important drivers because it helps people put themselves in the shoes and get more comfortable with the situation that generally can create some anxiety because they don’t know much about what’s coming up. Winston: That’s a great point. I love starting with the residents and talking to them about what they enjoy about the community and what the benefits that they see in your community are because you might have one perspective, but then the actual folks living there, you know, there might be certain things that are more important to them that you might not realize. Justin: Exactly. One thing that I found was really helpful, you have to almost think of, not your specific center, but you want to communicate what should somebody expect when they’re looking at senior living facilities? So that they can understand the things that are coming up. From a high level thought leadership perspective, just explaining what the experience looks like. But what I’ve seen really well with different clients that I’ve had done that are in the senior living spaces. Once you communicate that, you can almost send somebody that, hey, come in for a free lunch and check out our center. So at that point you’re able to educate somebody on what this looks like, but then you can also offer them in with a free lunch to check out the center, which worked really well with the different clients that I had in the past. Winston: That’s great. Yes. That’s the next question I had and it’s all well and good to help people through this process and to give them helpful information. Obviously you’re going to position that center, that community as thought leaders as a helpful resource. But at the end of the day, how do you use content marketing to generate leads? What are some of the best practices there? I liked the idea of offering to come in for a free lunch. What other types of offers or what other types of content would you say you could use to generate leads for the business? Justin: So what I would think of is ultimately what makes your center unique. Like what sort of demographic you’re trying to go after. You really need to understand the types of people that you’re trying to attract. And ultimately what sort of offer could you even help them with? I think that there’s different stages of the funnel at the top of the funnel where you’re still trying to communicate with somebody who’s doing research, you’re going to want to help out with educational content that’s going to help them through that research. So I think, I think the guide or ebook route is really helpful if you’re trying to inform somebody, I think an offer that could really help bridge the gap between somebody who is just doing research to actually making a decision is some form of a checklist ultimately like a pros and cons list of something of expecting like your comfort level or things that are coming up. Justin: Because that can really help somebody understand almost even self selecting that this is an option that they want to check out. So I think that the middle of the funnel where you’re trying to help somebody understand from the research to actually wanting to come in and take a look at the facility that you have to offer is you want to almost help this person understand and guide them to it versus really trying to force them to it. I think that the checklist is another great aspect of ultimately helping this person understand are they even ready yet? Like because you don’t want to just drive somebody in to check it out as much as you want somebody who’s going to be coming in who is open to the idea of that. Another thing is, is being able to show what the space looks like. Justin: So even doing a 360 view of what a room looks like or creating video content of what the events that go on. So that’s one thing I love about the senior centers as they have ways of making the people feel connected and I think that was the most successful piece is really helping the person or the viewer understand how these centers are really almost communities of people who are connecting with each other all the time and how you want to be, how you want to bring more people into that community. So I think video, I think a checklist of somebody helping and understand whether or not this is the right solution for them and then having a strong offer that is actually bringing them in, whether it’s coming to an event for free or it is coming in for a lunch or even like a tour of the facility that can be a really strong driver of helping ultimately think about what a, if this is the right solution for this person that’s doing research. Winston: Yeah. So beyond just the helpful resources you published in the form of blog posts or things that show kind of what life is like in that community. You actually want to show something that’s more of a helpful resource in the buying process that’ll actually help people decide, you know, how do I go about making the right choice in the right community and that should be, you know, from my experience, the best offers of that sort are less promotional and just strictly sort of helpful tools that they can use in that process. Could you tell me a little bit just for the folks who are not, you know, as into content marketing as you or I are, what are the mechanisms behind the actual lead generation piece of that? Like how do you exchange that information for generating a lead? Justin: Exactly. So like if you have educational content, you’re driving people to your site. If you don’t have certain things or specific items in place you’re, first of all, it’s like you want to make sure that you are using call to action or some sort of form of a link to send people to specific portions on the site. So you want to be strategic. Like when somebody is landing on a page, let’s say for instance, it’s a blog post. What are you talking about on that blog post? Do you want to connect? Is that blog post something that is talking about, educational content in the form of a guide that would be helpful? Or is it a blog post that’s talking about an event that’s coming up that ultimately you would want to maybe invite somebody to? So ultimately thinking about the context of the content and thinking about Linkedin, connecting people ultimately to the page where they can maybe sign up or register for an event that’s coming up. Justin: So ultimately the first thing is you want to think about Langston directing people to the pages were conversion can happen. Now when you send somebody to a page where the conversion is happening, like maybe capturing their information, a form is going to be extremely important because you need to capture this person’s information. You need to know who they are. Now, one thing I highly encourage you to think about or that to the viewer on this episode is when you’re thinking about optimizing your forms, if you’re trying to get people to come in, you want to be very strategic with what you’re putting on that form field. I’ve seen a lot of have maybe 10 different form fields of like asking for the address or a lot of information that maybe they’re not using. The longer your form, the less likely somebody is going to be to convert. So maybe asking where in the buying process this person is and maybe their email address, that’s helpful. And then ultimately the last piece would be thinking of some sort of automation. Once you get this person’s information, if you have helpful content, what content can you give to this person based on what you know about them down to maybe trying to be attentive, maybe coming into the facility and checkout or whatever the intent is. You want to have some sort of marketing automation in place where you can send them a series of emails that are making your process more efficient. So that you’re not trying to send one off emails over time and you’re being respectful of your time because it’s hard to do all this if you don’t have that automation in place. Winston: Yeah, that’s a great point. We talked a couple of weeks ago about speed to lead and just the importance of getting back to somebody quickly. And I think that you can do that in the right way where it’s personalized and it saves your sales folks time, but it’s also automated and it gives them good resources. So I think having those systems in place, it’s really, really important. And that’s a good point. I also loved your note about the forms and the length of those forums, you know, I’ll go to some senior living organization sites in the forum will be, you know, 10 different fields and some of which are really not relevant at that point. You just want to get that person’s information and some really pertinent information about who they are. Like you said how did you hear about us? Was it from a radio ad or whatever. Don’t include that in the initial form because that’s something you can talk to them later about in the sales discussion. It might just be another barrier to entry. Justin: Yeah, and and I think one thing that would even be helpful even before thinking about like the content you’re creating or like the conversion process, what I would highly encourage everybody to do is think about your audience, who you’re ultimately trying to attract. Again, it might be a person who is looking to live in the senior living center or it might be a family who’s trying to set up a living situation for their parents. Those are two completely different audiences, so on a form, in my mind, what I would love to know, what I would ask as a first as a first touch point would be your email address and then ask them sort of sound bite. Like are you, are you looking for a senior living center or are you looking for a parent who’s looking for senior living center? And then ultimately, Where are you in the process? Are you looking to do this in the next three months, in the next three to nine months? So by doing that you can be respectful and understand what sort of automation you put them in. So generally those three questions will be a great starting point that’ll give you, as the marketer a lot of information to make that experience helpful. Winston: Yeah. I love that you just mentioned, that helps you with automation and in what sequence to put them in because if you know that they’re looking for a place for their parents, the messaging there is very different than if they’re looking for themselves and also if you know what their time timeline looks like, then you might stagger out those messages accordingly. And it might be sort of a different sales cadence. I think it’s really smart. Winston: Yep. That sounds good. Let’s see. So next question I have for you. A lot of ideas. We’ve talked about what about content architecture and strategy. How would you recommend kind of organizing these efforts? We’ve talked in the past about a topic clusters and pillar pages, but what do you think for the senior living space specifically, what are some good ways to organize your content marketing strategy? What recommendations would you have? Justin: Yeah, so the way to think of it is put yourself in the shoes of the audience going through your site. A lot of people tend to overthink, like they need to be creating content all the time because they really need to keep generating anymore rankings. It can actually be more hurtful if you’re creating too much content and then it just becomes dead weight where it’s not getting rankings because it’s gonna end up hurting your domain authority. And Google looks at domain authority. How credible is your website? And if it’s lower, it’s going to be harder to actually get rankings. So the way to think of it just easier in a nutshell is ultimately think about creating the best experience for the people who are visiting your site. Yeah, you want to attract Google, but the way you attract to Google is you have to have a website that is connected, that is helpful, so when you have a blog post, for instance, ultimately what does that blog posts connecting to? What is the purpose of that journey of what you’re trying to communicate? So in an ideal world, when you’re thinking from website architecture, really be critical about the content that you’re creating and make sure that it’s helpful. For instance, if you have a blog post that sends somebody to a pillar page and what a pillar pages is it’s a website page that covers a broad topic in depth so it could almost be like senior living 101. It could be like, what is it like to live in a senior center? That could be almost like a form of a pillar page where you’d want to send somebody to. So what I need from a website architecture is once somebody gets to a page that you want, you want to control the experience. You don’t want to give somebody too many options. One thing that I’ve found with some seniors center websites that I’ve worked with before, some of them are a little antiquated. Justin: They had a lot of call to actions on one page. And really what that means is that it makes it a lot more difficult for the user, for the person is on the page to understand where they should go next. So you want to ultimately guide where you want this person to go. So be strategic with the content that you have and ultimately think about how this content is connected to the next. It’s like when you’re building a website or when you’re creating this architecture, think about like a blueprint, you wouldn’t create a house without a blueprint because ultimately, you know, your plumbing is going to be messed up. Maybe you’re going to have a room that’s not going to have a door. And ultimately how are you going to get into that room. You gonna enjoy it. So you want to think high level and plan out what the experience looks like as opposed to getting into the weeds and executing. So I think planning out how the architecture looks and mapping it will be super helpful. Winston: Yeah. Yeah, definitely. And I think just considering how helpful you want to be, in what way do you want to be helpful? What are the resources you need to provide. Wher should people find those resources throughout their journey on the website. Certain resources at a high level might make sense on the homepage or if you’re on the pricing page, maybe it’s a guide to pricing in different tiers of pricing or things of that nature. Comparison Guide of options and pricing tiers. So yeah, I think that’s a really good recommendation. Kind of really mapping out that blueprint and that strategy for the entire site experience before getting way too down into some rabbit hole and you don’t have that cohesive vision. Justin: Exactly. And there’s a lot of great content out there. I think I would even encouraged to look at your competitors, look at what they have, and then try to find gaps. That’s the other thing is don’t just create noise. Don’t create content that somebody else has already created. Really look at ways of being able to find opportunities where you can provide new value and meaning because ultimately as you do that, that’s what a search engine want. They don’t want the same exact content over and over because that’s not going to be something that’s going to be helpful from an Seo perspective or getting your website ranked, but you don’t just want to focus on rankings. You want to focus on the experience and ultimately helping somebody like you were talking about, if somebody comes to your homepage, what ultimately do you want to educate them on? You don’t want to show them everything you have. You want to show them the possible path that is not going to overwhelm them because if you overwhelm them, they’re not going to belive you. Winston: Yup. That’s a good call. So another question around rankings and kind of contents benefit for a community on a local level. So you know, if you’re a community in Richmond and you probably have a general radius where people will come in from and that’s generally where your residents come from. How can you use content to help your rankings at a local level to attract more local leads? Justin: Yeah, great question. There’s a lot of things that you could be doing at the local level to help search engines understand that you exist and that are important and that they should really pay attention to you. So the things that you would want to really focus on is making sure that you have a local listing through Google setup and that it’s clear. Making sure that they understand where the address is and that it’s an actual establishment and then that specific location and the reason why that’s important one a one is because google or search engines like Google are much smarter now. So if somebody types in senior living center, they might think about the national level of ultimately helping you out with this content. But Google is smart enough to understand that if you’re looking for content that’s like that, chances are you’re probably looking for something in your area so they’re going to look at where you’re searching from and connect you with listings that are in your area and that’s where the local listings going to come and that is helpful. Justin: But I think another thing, and this comes back to leveraging your current audience and just making sure that you’re approaching it from a brand perspective, is focusing on like testimonials, like websites that are focusing on review sites. If you can get your audience, maybe it’s the parents or maybe it is the actual person who’s living in this center. Making sure that not only are people creating content on your site or using that content on your site, that’s helpful, but putting that content on other sites like review sites. Because ultimately if you have that local listing and you focused on optimizing review sites with great content and people talking about your brand, that’s going to be another indicator for a search engine like Google. To be able to help understand that, hey, not only are you a local business, but that you’re a local business that they would want to showcase because that’s why ultimately nowadays, I feel like if I saw a restaurant that’s under four stars, am I actually going even eat there? And that’s awful because there’s probably restaurants that have great food that are under four stars, but the same thing goes with like a senior living center. If you could have review sites that exist, go into those and then optimizing and making sure that you are seen as a trusted advisor on those sites. That’s going to give me another thing that, that search engines are going to love. Especially the local level. Winston: Yeah. I think that’s a great point. And we’ve talked in the past on the podcast about just the power of reviews and if your site has more reviews on some of the referral sites, like a place for mom or Caring.com, just the likelihood and the number of leads that you get and the likelihood that those leads will close is just crazy. The incremental performance that you get from just having positive reviews and like you said, we go to new restaurants all the time, my wife and I will pick something and we go to Yelp and the first thing we do, we look at the reviews. And if one’s a 4.5 and one’s a 3, the choice is obvious and that’s just for dinner, not where you’re going to live the rest of your life. Winston: They have a much bigger decision. So that is a great point. Definitely a really important thing. On that note too, just getting the residents of the community to contribute some of this content. I’ve seen some senior living organizations that will actually solicit content from the residents and have them sort of guest blog posts in a way. And that to me that was an awesome tactic because it kind of combines the testimonial part of an actual resident of the community; What life is like there. It’s unbiased and it’s unfiltered. I thought that was a really neat idea to kind of showcase some of the experience of the folks in the community. Justin: Exactly. And on one side you’re creating great content. You’re creating human content, right? Because people are reading this and they want to hear the actual stories. The other thing though from it that I think is really helpful, if you’re able to get feedback, you as an organization, you should, especially if you’re in the business of working with people and making sure that you’re managing their experiences, you want their feedback. You should be critical about your business and understand how can you improve ultimately what do you like, but what would you like to see more of? Because if you’re able to solve for that, you’ll be able to understand what types of things you can be communicating to people that ultimately maybe they don’t know yet. And you can be a trusted advisor is saying ultimately these are things that we know are important to our audience. So if it’s important to our audience, this ultimately become something back that can help our either marketing or even sales collateral and it comes back to just all the experiences of the people that you have and focusing on your current residence is really the place to start when creating content and understanding how you can improve your business. Winston: Yeah. So that kind of segways me into the next question, which is, if I’m a senior living marketer and I’m working in a community and maybe it’s just me and I’m trying to do all of this stuff, taking on content marketing, if I’m not there yet, seems like a big ordeal. What are some of the recommendations that you have to kind of make it a little bit easier to get started in content marketing? How do I get going? And then also what’s my biggest bang for the buck? What would you say? Justin: Sure. So the best way to get started is I created the content marketing certification back in 2016. It’s a free course that will teach you how to create an effective; It’ll give you a foundation for creating a framework for creating content because you want to have a process, you want to be efficient, you don’t want to just jump right in. Like I said, you’re not just trying to build a house yet, you’re trying to build a blueprint to the house and it’s really going to be important to make sure that you have a correct process of framework in place and then you understand different things that you can be doing as a way of being able to make sure you’re creating content that’s actually going to be helpful. So I think the content marketing certification is a great place to start. On that, one thing I actually did when I was a customer success manager, I had one client specifically that was a one person marketing team for a senior living center. I won’t see where they are, who they were, just to keep them a little bit anonymous right now. But when I met them, I think that their attendance rate at there specific facility was it about 70 to 80 percent and they were looking to do different marketing ideas and what I worked on with them was ultimately what it makes you different. What do you want to communicate the value of your senior living center and what are you trying, what makes a happy residents, right? How are you trying to change these people’s lives? And what we did was we came up with a couple of blog series that ultimately rolled up into an ebook which was their first offer and it was really successful for them because of the blog posts. It focused exactly on highlighting this specific residents. There was a resident portion of being able to do a resident highlight. Justin: Then it was talking about the things that your center should be helpful. So they were talking necessarily about their center as much as it is when you’re looking for centers. These are the types of things you want to be looking at and then think about the content that you can repurpose into an offer. So especially if you’re a lean team blogging, maybe it’s a blog series that can roll up into an offer. Now the certification will teach you how to do this, and I built a really good relationship with this marketer and she let me know now, two years later, she’s at Max Capacity for, for the residents that they actually aren’t even accepting new applications. So I would say start small. Don’t try to reinvent the wheel just yet. You want to go through and get a framework for understanding where you should start and then think about things that you could do. Think of your marketing plan as like a puzzle. You want to think of a big picture. You want to break it up and do a bunch of little pieces and figure out how you can create those pieces over time to develop that bigger picture so that it’s not overwhelming. Because if you try to do everything at once, it’s going to be overwhelming and that certification that will be a great precursor to learning where can you get started and actually create content just like I was explaining. Winston: That sounds great. And I think you hit the nail on the head. And the length of time, it’s interesting that two years later that marketer is kind of where they wanted to be. And I’d say just other parting words of wisdom. It’s just patience and consistency and sticking with the plan. I see so many times organizations get started with content marketing. They give up after a couple of months because they don’t see the returns. And I always say that inbound and content marketing is such a longterm play and an investment, but I’ve seen it pay off so many times. And it’s well worth your time. Justin: Exactly. It’s a marathon. It is not a sprint. You might have some successful sprints and see some success with it, but just keep that training up and ultimately over time, as long as you’re consistent, you’re being genuine. The content you’re creating, not only will search engines catch up, but you’ll create a website that is a media site for the senior living center and people really appreciate it. Justin: Exactly. If you read the book, you’re actually able to take your final, your final test. So if you want it to read the book and just skip the certification or the course at the end of the book, you’ll be ready to earn your certification. So I strategically did that actually in the book. There’s homework after each chapter. So for instance, there’s a planning chapter and then it teaches you how to build out your actual plan. So if you’re looking to actually get started with tangible results, like the book could actually even be a better place because it’s a theoretical content with examples, but then there’s practical content of how you actually apply it to by the end of the book, you’ll have built this plan of content without even having to overthink it. Winston: That’s awesome. Yeah, it sounds like a really good resource. Well Justin, thanks again so much for being on the Senior Care Growth Show. If you’re listening and you happen to see an airstream trailer in California going back northeast, then give them a wave. Justin, thanks again so much for being on the show. Justin: Thanks again for having me. I appreciate it. Winston: Awesome. 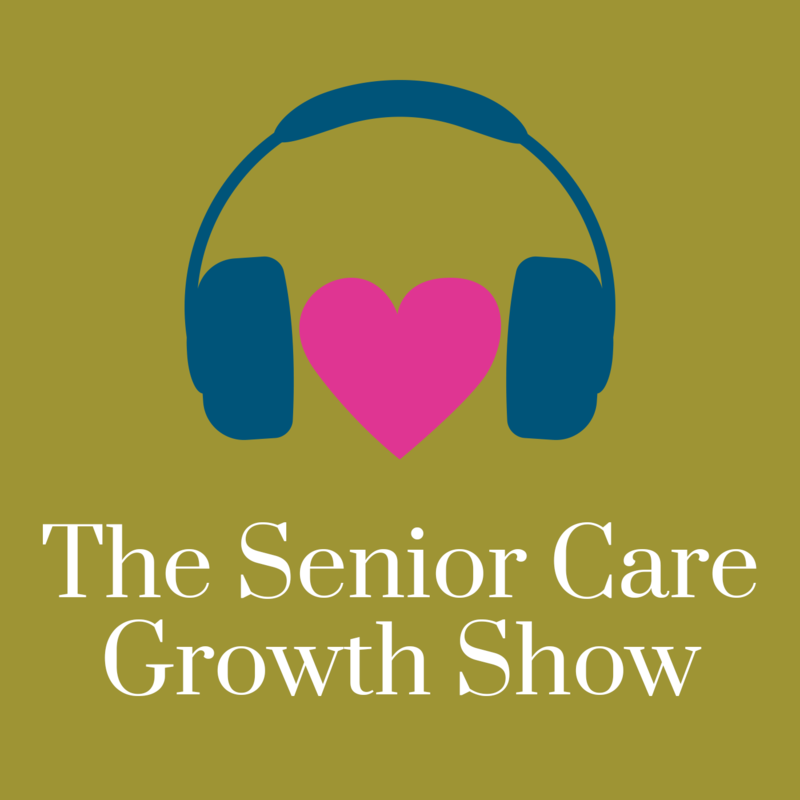 So thanks for tuning into this episode of the Senior Care Growth Show where senior care sales and marketers come to grow. My name is Winston and we will catch you next time. Thanks a lot.